It was too good last week, we start again :)! 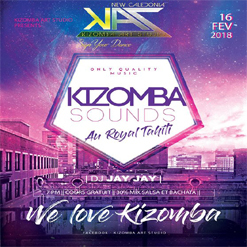 We give you all rendezvous on February 23 at the Royal Tahiti for a Kizomba Party! I prepare a playlist of madness to treat you! Beginner course evolutive with Léa Gru and myself at 19:00 to put you in the mood directly! 🙂 We prepare you a nice little move! And if you have never tried kizomba, now is the time! Do not hesitate ! Turn the word around and go back on the 23rd!